The big news today is that Marc Marquez (Honda) did not win in Brno — the first time in 11 races this year. Even stranger, Marquez failed to make the podium even though he did not crash. Marquez, who said he just didn’t feel right on the bike today, finished fourth while his teammate Dani Pedrosa took a narrow victory over Yamaha’s Jorge Lorenzo. Valentino Rossi (Yamaha) was a lonely 3rd place finisher, substantially ahead of Marquez, but well adrift of the lead pair. 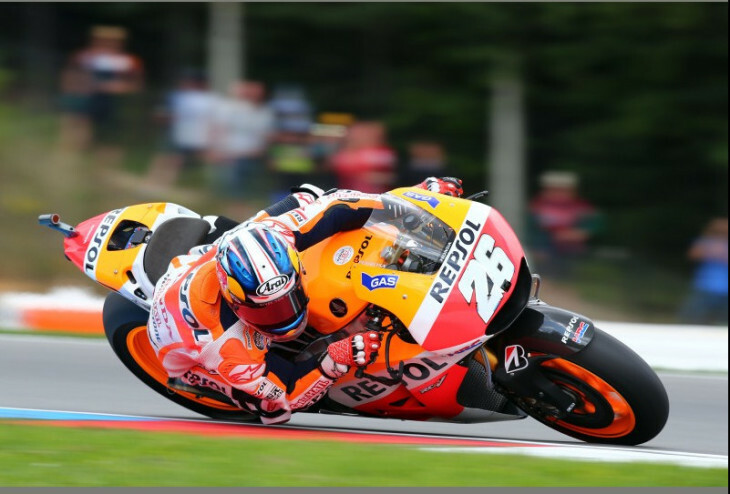 Despite finishing fourth today, Marquez still has a sizeable lead in the championship over second place Pedrosa. For additional details, results and points, visit the official MotoGP site. He’s certainly provided little reason to think otherwise. “That’s a rider and team doing what they’re supposed to do. Once he saw he couldn’t easily stay with Rossi, he pulled back from the limit and rode in safely for the points. He and his points lead are safe. I made a comment earlier but it never showed up so who knows..maybe it is in moderation, but it never said it was. Good to see Dani on top step again. Been a rough year for him even if he is in second place in the standings. Seeing as I am the only one that roots for the little guy it was a good weekend for both of us . Also good to see Lorenzo back in the game. And Rossi? I had written him off when he was riding the Duc. He’s proven me wrong. The guy still has some fuel in the tank. Speaking of Ducatis, they seem really fast early on in the last several races. I fail to understand why they can’t keep it up and finish a race strong. Rider? Bike? Tires? I’ve read in several articles that the Ducatis just devour tires. those performances you saw are only possible when they run the soft rear tyre. this little chestnut they’ve been afforded as a result of 11th hour OC rule amendments. the soft rear was originally spec’d for CRT use. however, when you pump 250 brake horse through them (a man’s hp #), they begin to heat cure and 3-5 laps is all you get. it’s basically racing on a qually tyre. you’re not going to get very far. So are the factory Honda and Yamaha teams always opting for the harder rear? Or do the rules not even permit them to choose the softer compound? Why would Ducati even opt for the soft tire if they know they are just going to chew it up from the very beginning? I guess it is better to look good for five laps than bad for the whole race? Maybe they even figure they can pick up a few extra points by playing defense against some of the satellite riders if the Ducs get out in front first? Q: Why would Ducati even opt for the soft tire if they know they are just going to chew it up from the very beginning? A: they’re picking the lesser of 2 evils. the flaws still present in their chassis still continues to plague them at getting the hard/harder compounds to work. Yamaha experiences this as well, but to a much lesser degree. in contrast, Honda seems to be able to make the hard compound work brilliantly at what seems to be EVERY track…? in EVERY condition…? and this while firing their engines as screamers…? it’s the damndest thing. It is a head-scratcher. I only just became a race fan this year after attending my first MotoGP event, so I don’t have any history that I can really compare what I am seeing to. But watching Marquez and Pedrosa brake as hard as they do, slide as much as they do, and hook up the rear as much as they do lap after lap with a hp advantage to boot and yet still seem to have prime grip all the way across the finish line is astonishing. The Honda just works so well, and has from the first race, that you’d think they were given the tires a year in advance to develop the bike around. I am not implying there is some sort of conspiracy, of course. It is just amazing how well the Honda works. 1. The Ducati qualifies better. Good for fans to see different colors up front once in a while and sets up #2. 2. Ducati is damn fast for 4-6 laps. Exciting for fans to see the top-4 make some moves instead of separating immediately, good for Ducati’s sponsors, who have to be asking why they’d invest in racing when there’s no chance of winning. The their credit, Dovi and Iannone are beating even Honda and Yamaha’s satellite factory bikes. That’s a big step forward. plus he started from pole and the team were just there testing 30 days ago. strange indeed. maybe the crew DID run out of fingers…? Or maybe the bet some $$$$ on Dani. His post-race comments suggest that he has been counseled to slow down and avoid crashing, which is the only way he doesn’t win the championship. Not so strange at all. That race was one to remember. It had to happen eventually that Marc won’t lose one but I have to be a bit sad for Marc that he didn’t get to break Ago’s record as that chance may not come again. I think we should take him at his word that is wasn’t any one thing but rather just a lack of feel in the setup and some of himself that kept him off the podium. It was great to see a not quite 100% Vale catch and pass the Super Alien though. The result probably did Dani and Jorge’s heads a lot of good too. Oh, wait, a couple more comments about the Brno weekend. 15 riders qualified within 1 second of pole! Just roll that around in your head for awhile. It’s not unusual to see maybe 10 guys within a second of pole but 15? Now pole times don’t have that much to do with race pace and final results but it does kind of put the lie to the claim that there are a bunch of second class riders and really slow bikes out there. All those guys are riding gods and the bikes, even the slowest of the slow, are amazing pieces of equipment. Comment 2. Moto3. Holy cow, 16 riders crossed the finish line in less than 2 seconds! Watch those last 5 laps and try to say the Moto3 isn’t the closest racing there is. The Moto3 race at Brno was superb! I love the Moto3 races and watch them whenever they are available. I would like to see Aprilia get into this class, as well as other manufacturers. Watching the way Marquez continually lost ground to Rossi over the latter part of the race, I was thinking his bike might have sustained some sort of damage as a result of his multiple clashes with Iannone, or perhaps he was having a problem with his tires. During his post-race comments, though, nope, he made no mention of any specific issues with the bike or the tires. Looks like it just wasn’t his day, and he was soundly beaten, fair and square. Helluva ten-race run for the kid, no doubt, and congrats to Dani. Strong efforts by Lorenzo and Rossi, as well. I don’t know why, but I just love Brno. Along with Mugello, those are my two favorite stops on the Moto GP calender. That’s a rider and team doing what they’re supposed to do. Once he saw he couldn’t easily stay with Rossi, he pulled back from the limit and rode in safely for the points. He and his points lead are safe. Others are encouraged by beating him but he and his team are encouraged by the control and maturity he showed in defeat. Chances are high that next race it’ll be back to “normal” and he’ll win again.